Your yearly maximum is the most your insurance plan is willing to pay for your dental work in one year. This maximum renews after December 31st, so any unused dollars at that time will go to waste. The average yearly maximum is around $1,000, but you should check with your specific plan about your maximum. The key is to try to reach or exceed this amount each year to use your benefits to their full potential. Your deductible is the amount of money you have to pay out of pocket before your insurance plan will pay for any dental services. 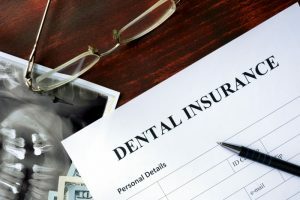 This fee can vary from plan to plan, and if you see an out-of-network dentist, you may have to pay a higher deductible. The average deductible is around $50, which restarts with the New Year as well. Do you pay a chunk of money out of every paycheck for dental insurance? If so, you’re paying premiums. Even if you don’t have any dental issues that need treatment, be sure to see your dentist twice a year for routine checkups and exams because preventive visits are usually 100% covered by insurance. This will help you cash in on your benefits and keep your oral health in check by detecting and preventing early signs of cavities, gum disease, and other dental problems. If you visit your dentist routinely and still have benefits left over towards the end of the year, schedule an appointment with a cosmetic dentist in Aurora to see if any smile enhancing treatments are right for you. Besides saving money, using your dental insurance benefits will save your smile too. If you aren’t regularly seeing your dentist, you could be putting yourself at risk for more expensive and extensive dental treatments in the future. Or worse, you have to visit an emergency dentist in Aurora because you have severe decay you had no idea about. To play it safe, see your dentist twice a year at minimum to use up your benefits and keep your teeth and gums healthy. Now that you know why it’s important to use your benefits before January 1st, do you have an appointment before the year ends? Talk to your local dentist to utilize your benefits and keep your oral health in good shape. Dr. Matt Mauck and Dr. Andrew Ricci enjoy getting to know their patients to provide them quality and personalized care. Their office even processes and files your insurance claims to help maximize your benefits. They currently run their own practice, and they can be contacted through their website or by phone at (303) 745-1400 for any questions.